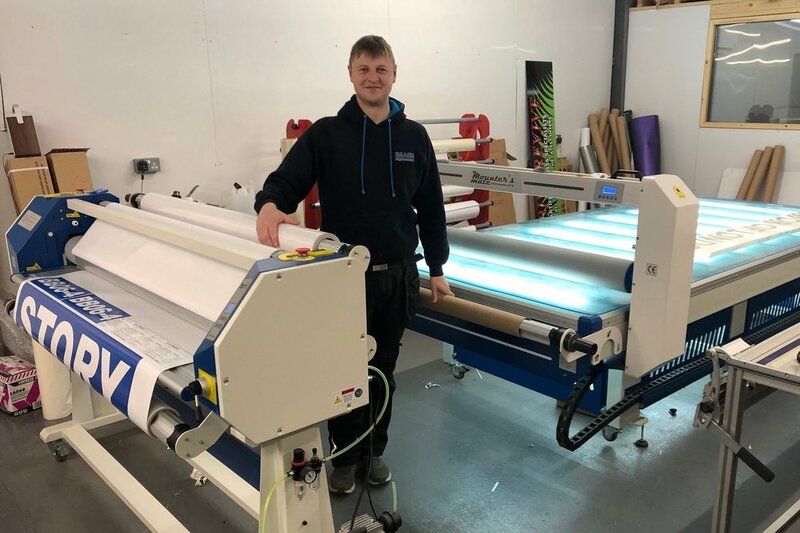 Installing a Mounter’s Mate laminator and flatbed application table has been like having extra staff, says Will McGillivray. “It’s been like going from a Fiesta to a Ferrari!” He’s the owner of Image Signmakers in Scotby on the outskirts of Carlisle. His company offers a full service of sign making, vehicle graphics, banners and similar large format printed work, to customers throughout nearby Cumbria and south west Scotland. It was set up in 2005 and now employs three people including Will. The main printer is a 1.3 m wide Mimaki CJV30-130 eco solvent printer-cutter, printing mainly onto self-adhesive graphics, which it can also cut to shape. The company already had a laminator to put protective and effects film onto the vinyl, but mounting the vinyl onto board and other materials was originally done by hand. At the end of 2018 Image Signmakers ordered a Workstation flatbed application table from Mounter’s Mate. This is the top of the Mounter’s Mate range and features solid construction and precision machined rails and linear bearings. The 10 mm flat toughened glass bed has LED illumination beneath and is supplied with a cutting mat to let the Workstation double as a work bench. The gantry includes a heated silicon roller and a feeder for application tape. A compressor powers the pneumatic roller lift. At the same time Image Signmakers ordered a new 1600hs laminator to replace its older machine. This is a fast and efficient 1.6m wide machine that can apply hot or cold adhesive film. A high quality pneumatic system ensures that pressure is applied evenly across the width.